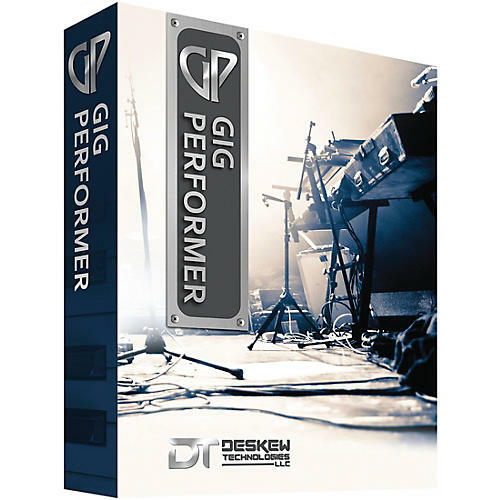 Created by brilliant musician-engineers and road-tested on countless gigs, Gig Performer is the ultimate plug-in host software, and thrives on any stage. Whether you're a keyboard player with a huge virtual piano-synth rig, a guitar player with multiple massive effects racks, or a front of house engineer running sound through an array of compressors and EQs, Gig Performer makes it all happen. Through a new innovation called Rackspaces, Gig Performer lets you load many dozens of plug-ins simultaneously, with customizable and MIDI-learnable controls. Create multiple Rackspaces and switch between them instantly with zero glitches in the sound. Not only can you set up a different Rackspace for each song in a set list, you can switch between multiple Rackspaces within a song. Thanks to its instant response and glitch-free switching your only limit is your creativity. Gig Performer's impressive list of cutting edge features allows you to control multiple instruments, layer sounds and employ authentic effects easily, with little power usage, on both Mac and Windows computers. No more confusing busses, sends, auxes or inserts used by traditional channel-strip approaches. Using the front and back panel views, simply connect plugins to each other any way you want, then custom-design Panels to control each Rackspace. You can then design a number of Variations, which allow multiple sets of settings for a single Rackspace and switch instantly between them. For instance, if you create a Rackspace consisting of an electric piano and some effects (phase, reverb, tremolo) then you can switch instantly from fast deep tremolo, to slow mellow tremolo plus reverb, and so on, even while still holding notes. Plus, you can customize your Panels using a variety of available widgets (knobs, switches, levers, LEDs), and color-coded face plates. Gig Performer runs on both OSX and MS Windows so you can enjoy its benefits on whichever platform you are most familiar. You'll also enjoy full OSC support. You can use touch surfaces such as Lemur or TouchOSC to control Gig Performer, as well as applications such as Max for even more sophisticated control. Gig Performer supports VST formats on both OSX and MS Windows, as well as the AU format on OSX. Gig Performer makes the most of your plug-ins whether you’re using it to control the effects processing of your instrument, your voice, or both simultaneously. You can also use Gig Performer with your existing environment, by training it to recognize the controls on your keyboards, OSC apps, MIDI expression pedals and control surfaces, and then use them to control plugin parameters. Of course, you'll also enjoy expected features such as layering and splitting operations (keyboard zones), and individual transposition.